Well, according to the greentards who want Prop 23 to fail thus leaving AB32 (California’s global warming law) in place it’s going to be a real panacea for California “green” business and it’s going to create “green” jobs. The problem is, while we’ll get a few “green” businesses, plenty of other businesses are fleeing what’s becoming known as the state of confusion for better places with less regulations to deal with, not to mention lower taxes. There are plenty of reasons a business owner would want to leave California for elsewhere. A business owner can move to Nevada and have no redundant agencies staffed by those who perhaps McDonald’s wouldn’t even hire. The two that come immediately to mind are Cal-OSHA and the California Air Resources Board (CARB). The former is a redundancy to the federal OSHA the latter redundant to the federal Environmental Protection Agency. Go to Nevada or just about any other state and you have the luxury of neither fining the hell out of you so they can justify their existence, creating binders full of new regulations designed to stymie business and creating mountains of paperwork a business has to complete. Move out-of-state and you may find you suddenly have time to actually try to expand your business instead of spending inordinate amounts of time and money to be compliant. After the state gets done business owners then get the luxury of dealing with myriad regulations from counties and cities. State Fund has over $22 billion in assets and employs approximately 7,500 people (the number varies based on State Fund’s current percentage of the market) of whom over 500 are attorneys. Historically it has insured an average of 23 percent of the market each year since its creation by the Legislature in 1914. Its market share spiked to over 50 percent in years 2002-2004 when a large number of private carriers left the market. In keeping with its mission, State Fund has an open door policy writing insurance for California businesses who need workers’ compensation insurance. State Fund insures approximately one in five businesses in California. State Fund also serves as a third party administrator adjusting claims for almost all of the state agencies. To add to this State Fund has a large “captive audience” because they will insure those who are unable to get private WC coverage. This allows them to increase rates whenever they like and many won’t complain because they have no where else to go, which gives them a kind of monopoly in their market. It also helps justify rate increases filed for by private WC carriers. You can bet these rate increases hike the cost of doing business in California up to the point where many businesses leave the state. 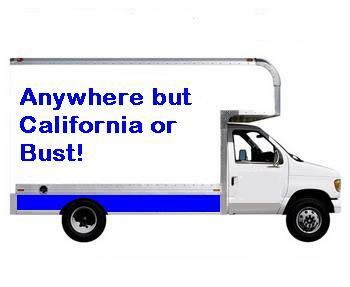 In fact, contrary to the greentard BS surrounding AB32 and how wonderful it is, there are indeed many businesses fleeing the state and if Prop 23 loses and leaves AB32 in place the you may see a stampede of businesses leaving California. Think I’m full of that global warming hot air? Well, let’s go to the Business Relocation Coach and see what someone in the know has to say about who’s leaving. He has a post titled “California Companies Moving Away or Shifting Work Out Reaches New Record: 158 (for 2010 alone)” that is very telling indeed. In the three weeks since my last tally, I’ve learned about another 14 companies that have left California completely or re-directed capital to build facilities out of state. The names of the 14 and justifications for listing them appear below. Today’s entry builds upon the Sept. 21 entry 144 Companies Shrink from Calif. This Year – Three Times the Total for All of 2009. Been hearing about all those “green” jobs that AB32 is going to create? Fuggedaboutit. Sounds like one’s sick not only of California but the bad business climate in the United States and will leave the country. Well now, that certainly bodes well for having all those “green” jobs in California doesn’t it? Wake up folks! If Prop 23 fails, California fails and it will be a gigantic fail causing more unemployment, more business to flee, lower tax base that will exacerbate the state budget problems. I’d go so far as to wager that the State of California will have to go into bankruptcy because there will be so much less taxes left that it will not be able to stay functional. If that happens you’ll see more business shutter their doors, more unemployment and yet less taxes being taken in while the payout for the unemployed and those on welfare will increase dramatically. Something will have to give. You can’t run a state when there’s no one left making any money to pay taxes. I know this is contrary to libtard Keynesian economics, but that’s the score. California is already into enough CO2 Insanity not to mention plain old-fashioned insanity. Vote yes on Prop 23 and stop the craziness.